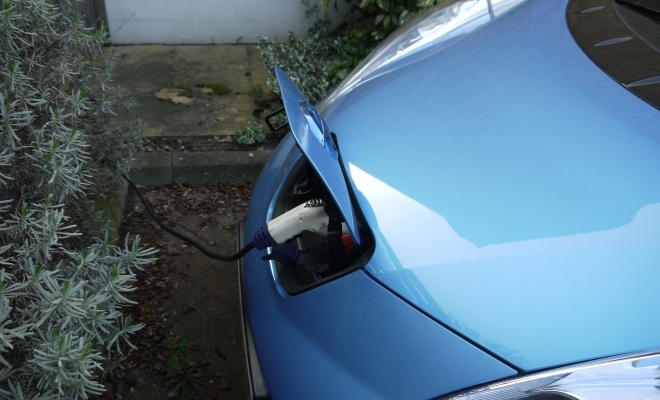 Fortunately I haven’t been living in a Nissan Leaf – I’m not David Blaine – but I have put a few miles on the electric car that Nissan kindly loaned me last Friday afternoon. 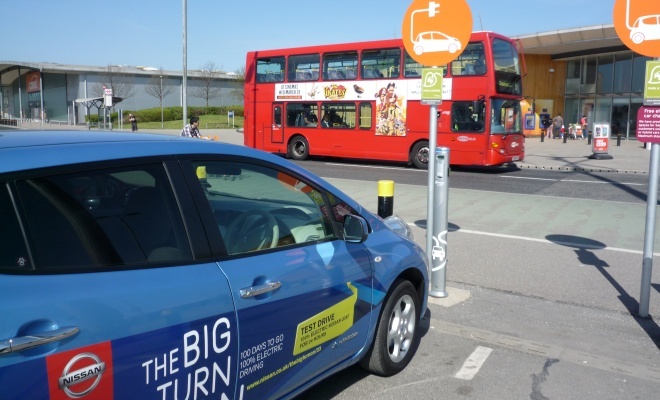 I’m participating in The Big Turn On – a 100-day effort to highlight electric motoring. My first worry was recharging the car, after failing to get a specific charging point installed. A very helpful engineer from British Gas called at my home a week before the Leaf arrived, but after some torchlight prodding under kitchen cupboards announced that the fitment wouldn’t be a trivial matter. The engineer was not allowed to start work until he’d verified that the gas supply to the house was adequately earthed. He must visually inspect the electrical connection to the copper gas pipe, which according to regulations is attached within 6cm of entering the building. Unfortunately for me, the gas pipe enters behind a fitted cupboard, and checking the earth strap required dismantling half the kitchen. So after some struggling, covered in dust, we gave up. 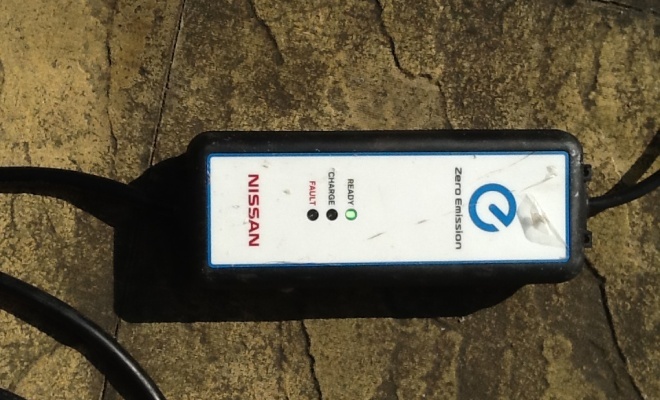 Nissan gave me strict instructions not to charge the Leaf from a household socket but I did so anyway, hooking up to an outlet designed for lawnmowers. It at least has the benefit of a dedicated residual current detector, so I won’t be electrocuted by short circuits. The faceplate of the socket got a little warm as 2.4 kilowatts sped through it for several hours, but I kept a wary eye (and a cautious nose) on things and nothing untoward happened. I’ve since recharged the battery twice without incident. Mundane trips around town reinforced things I knew about the Leaf already – the steering is one-finger light, the throttle response is as linear and predictable as a steel rule, the ride is a little bouncy and the brakes lack initial bite. But all told it’s a doddle to drive and quite pleasant. 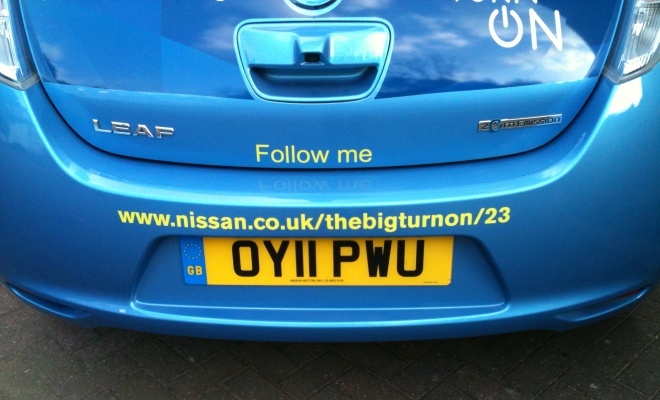 Mrs GreenMotor quickly gave the car the thumbs up, despite huge initial scepticism. “It’s a really nice car,” she announced on day 2, in the tone of voice she might normally use upon finding that a dessert resembling a dog turd is actually a delicious chocolate log. 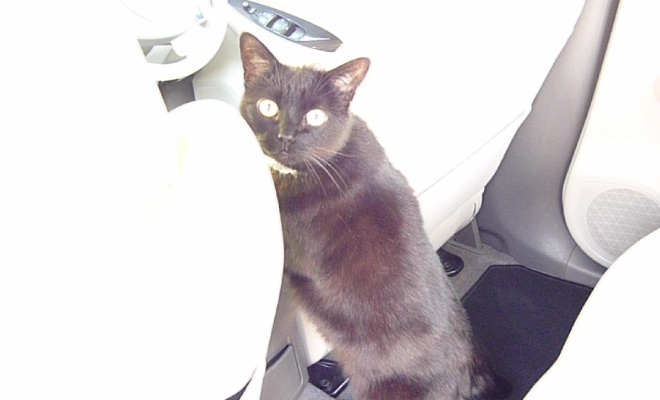 The GreenMotor cat has also given the car a rare seal of approval, producing markedly less than her usual caterwaul on the way to and from the vets. The quiet, smooth acceleration of an EV is obviously less frightening than our ordinary car – an almost equally quiet and smooth Honda Civic Hybrid. What can I say, she’s a fussy cat, or perhaps she detects high-pitched noises that pass me by. In common with my hybrid, the Leaf has a high-level digital speedometer, which I love. Cars with analogue dials seem as archaic as a brass-horned gramophone once you get used to digital. I’ve found the rest of the in-car info systems easy and straightforward to use – once I’d realised that the previous keeper had set the central display screen to minimum brightness. Hooking up to the wireless CarWings service was painless, and I can now monitor battery charging and switch on heating or aircon remotely, from my iPhone or iPad. Five days in and I’m feeling very positive about the Leaf – but partly that’s because I haven’t had to pay for it. I still can’t decide how I’d feel if I’d parted with £26,000 to own one. Do let me know what you think of the Leaf by joining me for a chat on Twitter.